(30) PAMPHLET: Christmas Pamphlet-Condition: Good- corners creased a small amount. A little discoloration.- One small page folded in card shape. 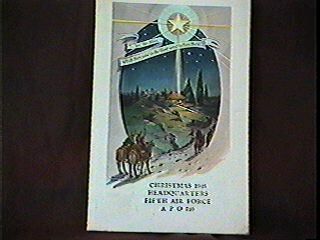 "Christmas, 1946 Headquarters Fifth Air Force APO 710" Colored picture of Bethlehem scene on cover. Inside lists Christmas activities. Mentions Japanese service in Yamato Bldg. Price: $8.00 + shipping.